✅TRADITIONAL COLONIAL AESTHETIC: This elegant colonial cabinet becomes a functional centerpiece in any room, adding charm and whimsy along with ample storage and display space. ✅ADJUSTABLE SHELVING: Four adjustable shelves allow for a variety of different sized items to be stored within the cabinet, or remove all of the shelves to create a single large display alcove. ✅LARGE STORAGE DRAWER: A large central drawer is perfect for storing silverware, knick-knacks, towels, or other household items that you want to be accessible while still hidden away. 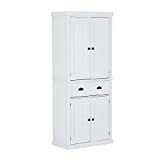 ✅DURABLE AND STABLE: Constructed from durable engineered wood with a reinforced backboard and wall attachments for stability, this cabinet can be used daily as kitchen, bedroom, or bathroom storage. 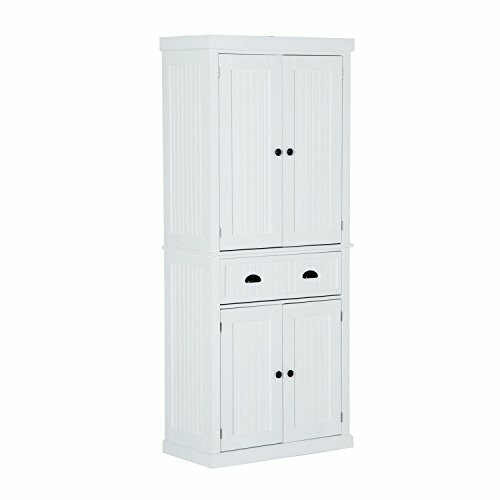 ✅VERSATILE STYLE: This cabinet, with its stark lines and solid block color, will fit with most decor and will enhance the look of bedrooms, bathrooms, kitchens, or hallways while adding a functional storage option.